By Lindsey Johnson for Design Mom. We’re on Menu #8 of our Lunch Box Series — and this continues to be a lot of fun for us! I hope you’re enjoying this series as much as we are. For today’s menu, I’m sharing one my kids really, really like. It includes a green smoothie. We’ve totally jumped on the green smoothie bandwagon and we’re not ready to get off yet. In the picture, I’m showing a store-bought green smoothie that works great when you need to take a little shortcut. Otherwise, we normally do fresh ones and put them into an insulated bottle. Generally it’s okay to make them the night before, but if you’re having one in the morning, make a little extra to send with school lunch. : ) I’m also thinking my older kids would probably need two muffins to fill them up. One is enough for my Kindergartener. The dipping sauce for the celery sticks is just a little Ranch dressing powder mixed with Greek yogurt. I used a homemade mix that a friend gave me. It was all over Pinterest awhile back. Packaged kind is fine too. The lunch bag pictured is one of my favorite bags. There are ice packs in the bag itself, so you freeze the entire bag and it keeps everything inside nice and cold. My daughter actually complained one time that it was too cold! I use it when I know everything needs to be kept extra cold to be enjoyable. – It’s more budget-friendly (and eco-friendly) to make your own smoothies. You can freeze them in a reusuable bottle or use an insulated bottle to keep them cold. What do you think? Would your kids enjoy a smoothie with their lunch? Are you already doing that? That looks amazing! And it looks like summer which is desperatley needed over here. I think this is my favorite lunch! (I love this series!!) My 7-yr-old won’t eat sandwiches, but she LOVES everything in today’s post. Well, we’ve never tried green smoothies…we’re traditional strawberry smoothie lovers. Maybe we’ll give them a shot. Can you share a good recipe? Laura, I really love the green smoothie recipe from http://www.simplegreensmoothies.com. (Disclosure – I have collaborated with them on several projects and have tried dozens of their recipes.) After making their recipes, my husband was like, “Oh, I do like green smoothies!” haha Mine tend to be a little too green for his taste. 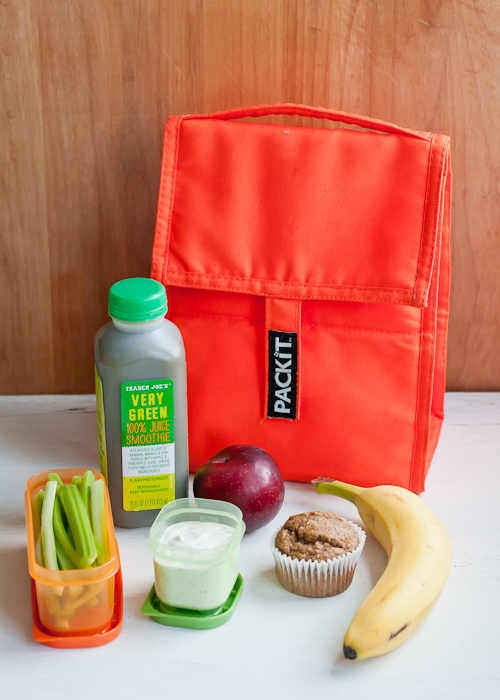 We are big green smoothie fans…and yet I’ve never thought to send one in the lunch box before! How does the one you used hold up (i.e. does it settle in the bottle or can it be drunk as is)? My daughter is a HS freshman and swims every morning at 6 for a couple of hours. While I get lunches ready, my husband makes a smoothie and pours it into a blender bottle for her. After swim, she drinks her breakfast on the way to school. It is great. The bottle solves the settling problem blends everything back up. Thanks for adding this in , Becki! That was what I was going to say. Usually it just needs a good shake or two for it to come back together. The pack it is great! I found mine at tj maxx for $10! I am loving this series! My kids are homeschooled, but I’m liking these ideas for field trips and just days at home! Thank you for putting it all together!